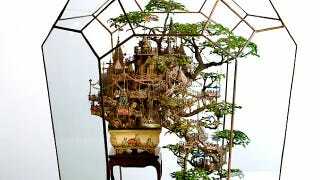 My source of creations are my early experience of bonsai making and maze illustration. These works make use of an aerial perspective, which like the diagram for a maze shows the whole from above (the macro view) while including minute details (the micro view). If you explore any small part of my works, you find amazing stories and some unique characters. Cultivating a modern Bonsai style by adding a theme of relationship between human and nature to a Japanese classical Bonsai style. Originally, Japanese Classical Bonsai Style portraits the beauty of nature in miniature. Bonsai-B is an experimental approach to turn out a modern Bonsai style that portraits the beauty of spiritual accordance between human and nature in miniature. Classical meaning of the slogan, "Nunc est Bibendum," was Bibendum drinks up any Obstacles. Now is the time to evolve Bibendum with the same slogan, "Nunc est Bibendum," by adding a modern connotation of Bibendum drinks up any Entertainment. Creating an image of vast and full of Hawaiian resort originally from a classical pineapple can.This "Hawaiian Pineapple Resort" is an experimental approach to turn out a future masterpiece by adding new locality, time performance and theme to a classical object. A tower made out of ice cream packages. Via Tokyo Good Idea — hat tip to Fiah!